Double X Science: Towards better drug development, fewer side effects? Towards better drug development, fewer side effects? You may have had the experience: A medication you and a friend both take causes terrible side effects in you, but your friend experiences none. (The running joke in our house is, if a drug has a side-effect, we've had it.) How does that happen, and why would a drug that's meant to, say, stabilize insulin levels, produce terrible gastrointestinal side effects, too? A combination of techy-tech scientific approaches might help answer those questions for you -- and lead to some solutions. It’s no secret I love lab technology. I’m a technophile. A geek. I call my web site “Biotechnically Speaking.” So when I saw this paper in the September issue of Nature Biotechnology, well, I just had to write about it. 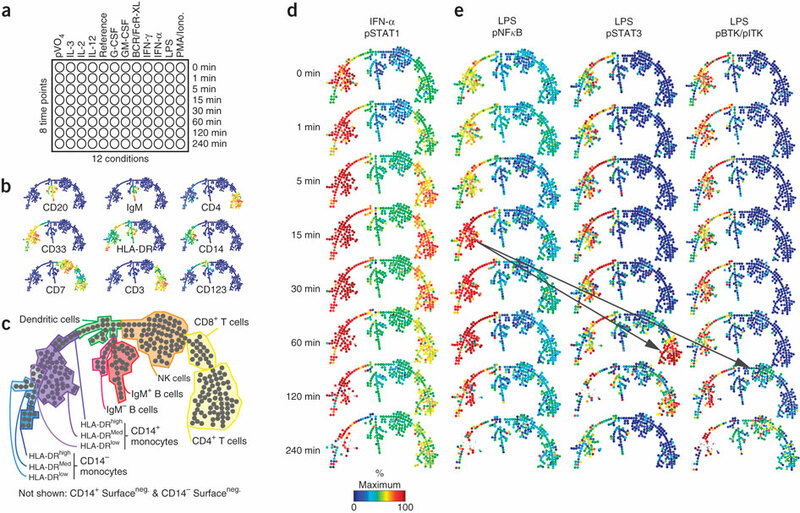 The paper is entitled, “Multiplexed mass cytometry profiling of cellular states perturbed by small-molecule regulators.” If you read that and your eyes glazed over, don’t worry –- the article is way more interesting than its title. Here’s the basic idea: The current methods drug developers use to screen potential drug compounds –- typically a blend of high-throughput imaging and biochemical assays – aren’t perfect. If they were, drugs wouldn’t fail late in development. Stanford immunologist Garry Nolan and his team, led by postdoc Bernd Bodenmiller (who now runs his own lab in Zurich), figured part of that problem stems from the fact that most early drug testing is done on immortalized cell lines, rather than “normal” human cells. Furthermore, the tests that are run on those cells aren’t as comprehensive as they could be, meaning potential collateral effects of the compounds might be missed. Nolan wanted to show that flow cytometry, a cell-analysis technique frequently used in immunology labs, can help reduce that failure rate by measuring drug impacts more holistically. Nolan is a flow cytometry master. As he told me in 2010, he’s been using the technique for more than three decades, and even used a machine now housed in the Smithsonian. 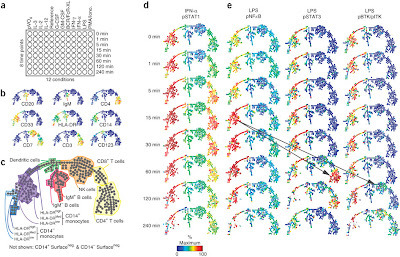 In flow cytometry, researchers treat cells with reagents called antibodies, which are immune system proteins that recognize and bind to specific proteins on cell surfaces. Each type of cell has a unique collection of these proteins, and by studying those collections, it is possible to differentiate and count the different populations. Suppose researchers wanted to know how many T cells of a specific type were present in a patient’s blood. They might treat those cells with antibodies that recognize a protein known as CD3 to pick those out. By adding additional antibodies, they can then select different T-cell subpopulations, such as CD4-positive helper T cells and CD8-positive cytotoxic T cells, both of which help you mount immune responses. 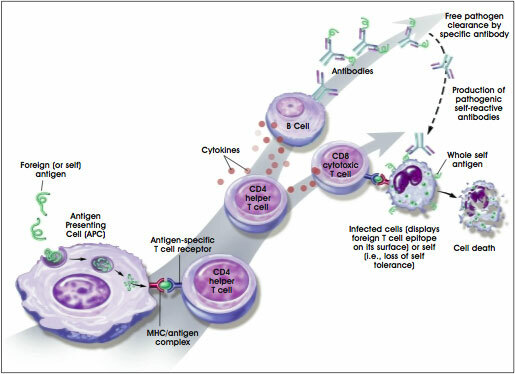 In a basic flow cytometry experiment, each antibody is labeled with a unique fluorescent dye –- the antibody targeting CD3 might be red, say, and the CD4 antibody, green. The cells stream past a laser, one by one. The laser (or lasers –- there can be as many as seven) excites the dye molecules decorating the cell surface, causing them to fluoresce. Detectors capture that light and give a count of how many total cells were measured and the types of cells. The result is a kind of catalog of the cell population. For immune cells, for example, that could be the number of T cells, B cells (which, among other things, help you "remember" previous invaders), and macrophages (the big cells that chomp up invaders and infected cells). By comparing the cellular catalogs that result under different conditions, researchers gain insight into development, disease, and the impact of drugs, among other things. But here’s the problem: Fluorescent dyes aren’t lasers, producing light of exactly one particular color. They absorb and emit light over a range of colors, called a spectrum. And those spectra can overlap, such that when a researcher thinks she’s counting CD4 T cells, she may actually be counting some macrophages. That overlap leads to all sorts of experimental optimization issues. An exceptionally talented flow cytometrist can assemble panels of perhaps 12 or so dyes, but it might take months to get everything just right. That’s where the mass cytometry comes in. Commercialized by DVS Sciences, mass cytometry is essentially the love-chid of flow cytometry and mass spectrometry, combining the one-cell-at-a-time analysis of the former with the atomic precision of the latter. Mass spectrometry identifies molecules based on the ratio of their mass to their charge. In DVS’ CyTOF mass cytometer, a flowing stream of cells is analyzed not by shining a laser on them, but by nuking them in superhot plasma. The nuking reduces the cell to its atomic components, which the CyTOF then measures. Specifically, the CyTOF looks for heavy atoms called lanthanides, elements found in the first of the two bottom rows of the periodic table, like gadolinium, neodymium, and europium. These elements never naturally occur in biological systems and so make useful cellular labels. More to the point, the mass spectrometer is specific enough that these signals basically don't overlap. The instrument will never confuse gadolinium for neodymium, for instance. Researchers simply tag their antibodies with lanthanides rather than fluorophores, and voila! Instant antibody panel, no (or little) optimization required. 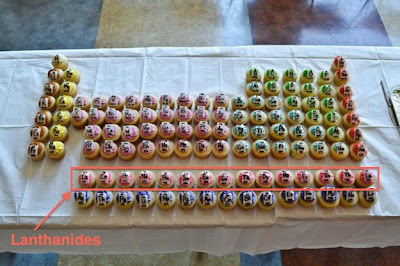 Periodic Table of Cupcakes, with lanthanides in hot pink frosting. Now back to the paper. Nolan (who sits on DVS Sciences' Scientific Advisory Board) and Bodenmiller wanted to see if mass cytometry could provide the sort of high-density, high-throughput cellular profiling that is required for drug development. The team took blood cells from eight donors, treated them with more than two dozen different drugs over a range of concentrations, added a dozen stimuli to which blood cells can be exposed in the body, and essentially asked, for each of the pathways we want to study, in each kind of cell in these patients’ blood, what did the drug do? 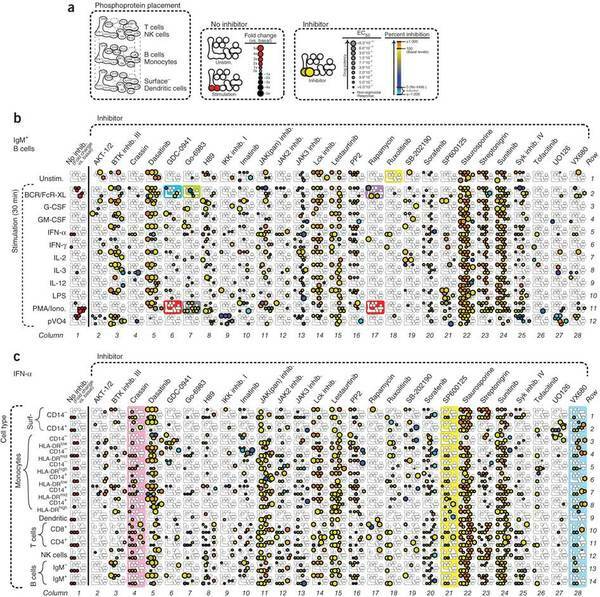 To figure that out, they used a panel of 31 lanthanides –- 10 to sort out the cell types they were looking at in each sample, 14 to monitor cellular signaling pathways, and 7 to identify each sample. I love that last part, about identifying the samples. The numbers in this experiment are kind of staggering: 12 stimuli x 8 doses x 14 cell types x 14 intracellular markers per drug, times 27 drugs, is more than half-a-million pieces of data. To make life easier on themselves, the researchers pooled samples 96 at a time in individual tubes, adding a “barcode” to uniquely identify each one. That barcode (called a “mass-tag cellular barcode,” or MCB) is essentially a 7-bit binary number made of lanthanides rather than ones and zeroes: one sample would have none of the 7 reserved markers (0000000); one sample would have one marker (0000001); another would have another (0000010); and so on. Seven lanthanides produce 128 possible combinations, so it’s no sweat to pool 96. They simply mix those samples in a single tube and let the computer sort everything out later. This graphic summarizes a boatload of data on cell signaling pathways impacted by different drugs. When all was said and done, the team was able to draw some conclusions about drug specificity, person-to-person variation, cell signaling, and more. Basically, and not surprisingly, some of the drugs they looked at are less specific than originally thought -– that is, they affect their intended targets, but other pathways as well. That goes a long way towards explaining side effects. But more to the point, they proved that their approach may be used to drive drug-screening experiments. And I get to write about it.